1. Purchase a couple of pairs of thermal bottoms, tops and socks in England. I would suggest buying initial pairs in England as firstly you can get them fairly cheap, and secondly it means you have the option of wearing them as soon as you arrive in your cold destination. 2. Purchase your Jacket and Salopettes in England. Again, I would suggest this as firstly it can be cheaper (especially when you time it right in regards to sales!). Secondly, you will want that jacket on as soon as you land in your destination! Don’t underestimate how cold it will be! 3. Purchase your boots and skis at your destination. In my situation, my rep took our group round some of the local ski shops that would provide us with a significant discount. Therefore, it worked out cheaper and easier to purchase in the destination rather than buying set priced equipment in England that you will then have to pay extra for to fly over. Also, in a lot of cases equipment in England is produced based on Europe skiing whereas the equipment in your destination will be produced based on the terrain you will come across. – Boots: In my case (and opinion) boots are the most important piece of equipment! I was a ski instructor; therefore I knew I would be living in my boots (quite literally) from 7.30 in the morning till 4.00 in the afternoon (or later depending on my personal skiing schedule). For this reason I had my boots heat moulded to my feet, to allow ultimate comfort and ski performance! – Skis: Prices for skis vary according to visual design, style, performance and brand! 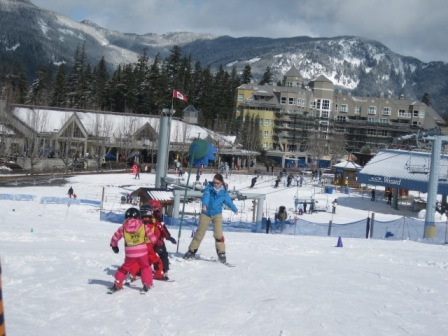 In my case I knew I would have children skiing all over them, resulting in…scratches! For this reason visual design was not important! I also knew that I would need a style and performance that would accommodate teaching children to ski, such as, a pair that are easy to turn and ski backwards in! (Ask the staff in the shop for advise on this…they are the experts)! 4. Further Snow-wear Accessories. Based on the same reasons as stated in the above. – Ski Gloves / Socks: Buy initial ski gloves and socks in England; you will then have the option of wearing them straight away on arrival. Then buy further pairs (if needed) later into the season. – Snow Boots: Buy a pair in England; you will need to start wearing these as soon as you arrive at your destination (snow boots are the most worn shoe after ski boots)! – Goggles / Sunglasses: Purchase in destination, as you will get discounts and the products will be of better quality based on the more extreme weather types compared to Europe. – Helmet: Purchase in destination as you will get various discounts and the products will be of better quality. 2. Try and have a budget in mind for each product, such as, $500 on boots, and inform the sales staff member of this straight away (naturally, they will always try to sell you the most expensive style first)! Next Post Top 5 trekking kit items not to be forgotten! Previous Post When is the best time to do farm work in Australia&#8217;s Outback?